Unlike other kits, you do not need to run any bulky wiring back to your battery. 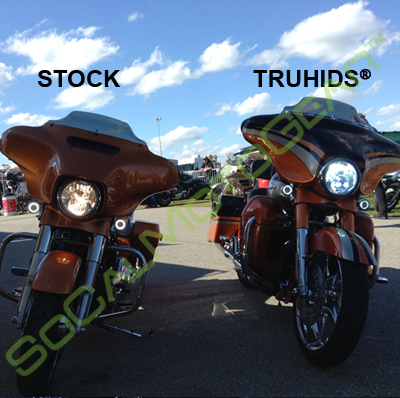 This professional Harley Dual-Bulb Kit will completely replace your factory lighting to our HID lighting. This is for bikes that came with the H9 and H11 bulbs from the factory. This kit will enable you to have HIDs for your LO and HI beams. Our Kits are custom designed for Harley motorcycles, including everything needed for a smooth Plug ‘N Play installation. See 3x brighter and seriously improve your RIDE at night! *See note below about High-Beam usage. High Intensity Discharge Lighting is much brighter and projects a further and wider beam at a fraction of the cost compared to factory LED systems that can cost upwards of $500 or more. Our HIDs will throw a much further and wider beam down the road allowing you to see much more. Industrial strength double sided 3M pad(s). HI/LO BEAM HID KIT: Ships with 2 Rugged Ballasts, 2 HID bulbs & all necessary installation cables and hardware. 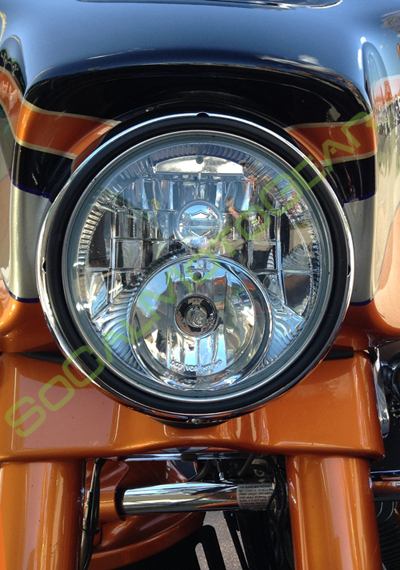 Fitment: Will fit the new Harley style Dual-Bulb Halogen headlights that are found on 2014 models & headlights that uses a Dual-Bulb halogen on top and bottom. NOTE: If your motorcycle has a built in factory garage door opener when engaging your HI BEAM, installing the HID in the HI BEAM will no longer work with your garage door opening feature. HIDs do not come on instantly as your normal stock bulbs. On start-up, HID's take about 15-20secs or longer to completely reach it's full brightness unlike a stock halogen bulb. Use caution and understand this when using your high beams. 35W HID system. 35w per ballast. Traditionally poor factory lighting makes this the perfect upgrade for your bike.